Through the participation of Attorney Julio César Crivelli as Legal Counsel for the Argentine Construction Chamber and as Delegation Chairman for that Chamber within the jurisdiction of the City of Buenos Aires - in recent years accompanied by Susana Elena Vega, Atty. - the firm has taken active part in numerous committees set up to study and approve laws and regulations with a direct impact on construction and concession contracts for public works and services, with application not only in the City of Buenos Aires but also at a National level. Laws No. 23696 and No. 23697; Decrees No. 1755 and No. 1757 of 1990. Rescission and Renegotiation of Public Contracts and Privatizations of State Companies. Law No. 23.982 and Regulatory Decrees. Decree No. 2140/91 and Decree No. 211/92. Law No. 25.344 and its Regulatory Decree No. 160/00. Law No. 25.561. Decree No. 1023/2001; Decree No. 1299/2000. Decree No. 802/2001; Decree No. 976/2001 and Decree No. 1377/2001. Law No. 13.064 and regulatory and supplementary legislation. a) Contract closing for Piedra del Águila and Reyunos electric power facilities. Client: UCASA- JOSE CARTELLONE CONSTRUCCIONES CIVILES S.A.
b) Enarsa Call to Tender: No. 001/2007 Provision of barge-mounted thermal generators. c) Enarsa Call to Tender: No. 001/2009 - Renewal resource power provision. d) Consultant for execution of construction contract for the dual-triplet 132 kW Loma de la Lata - el Trapial power line. Client: ALUSA ENGENHARIA LTDA (BRAZIL) in consortium with VATECH. Formulation and follow-up on administrative and legal claims. PETROBRAS ENERGIA S.A.'s interests in TRANSENER (the country's exclusive 500 kW power transmission firm). f) Consultant for National and International Public Call to Tender bids for electric power distribution in the northwestern region of the country. (Civil and Electro-mechanical Works for Silo Grain Storage). a) Closing of construction contracts and claims negotiation for Silos belonging to the former National Grain Board in the Argentine Northwest. b) Closing of construction contracts and claims negotiation for Silos belonging to the National Architecture Board in Unit VII of the Port of Rosario, in San Pedro and in Puerto Nuevo (Buenos Aires). 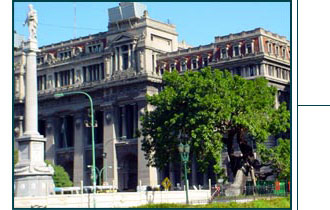 a) Within the jurisdiction of the City of Buenos Aires: Renegotiation of Housing Institute building contract. Clients: Constructora Lanusse S.A.; Vivian Hmnos; Vidogar S.A. and CRIBA S.A., among others. b) At a national level: Federal Housing Plan: Claims concerning higher costs. a) Recognition for several companies of higher costs and late-payment interest due. Among other firms: José Cartellone Construcciones Civiles S.A., CONEVIAL (Grupo Bibiloni), CODI S.A.
b) Consultant for "PILAR - PERGAMINO" project construction and concession contract. Client: CAMINOS DE AMERICA S.A. (Grupo Eurnekian). c) Consultant for renegotiation and closing of concession contracts for Autopistas 9 de Julio. Client: CCI SA. And for the Rosario By-Pass. Client: Aragón S.A.
d) International Call to Tender No. OSP/BOL/231/292 put out by the National Road Service of the Republic of Bolivia. a) International Call to Tender for construction of the Embalse El Bolsón Dam on the Albigasta River and the Administration and Execution Project for piping water from the Embalse El Bolsón Dam to Santa Josefa. Client: Constructora Andrade Gutierrez S.A.
b) National and International Public Call to Tender RHF 02/02 - Water Regulation and Flood Control in the Northeastern Region: Stage I, La Pampa Province. Client: ECODYMA Empresa Constructora S.A.
c) National and International Public Call to Tender 1/02 - Channeling of Cañada de Las Horquetas A1 Spillway, Stage II, Section I.
d) Contract No.40/01 for Rain Sewer Drainage Works for Northern Access to the Federal Capital and the Avenida General Paz - Aliviador Cildañez motorway. Client: Jose Cartellone Construcciones Civiles S.A. Consultant for Guiding Contract Plan for PETROBRAS ENERGIA SA Refin. in Bahía Blanca.